As an investment silver bullion coins have both pros and cons, and understanding both of these aspects will help you determine whether this precious metal is the right investment choice in your specific circumstances. There are many physical precious metals investment options, including gold bullion, platinum and palladium coins, bars and even ingots. All of these can be excellent investments, and silver is a very popular choice for many, especially for budget conscious people. First of all, it’s worth mentioning that silver as a metal is almost never mined directly but rather is a by product of other precious metals mining process. This metal has a lot more industrial applications than any other precious metal and is used in such miniscule quantities that it’s almost never possible to recycle it back into production. It’s fair to say that 90% of industrial silver is never recovered and gets destroyed. Every day we are destroying more silver than we are mining. 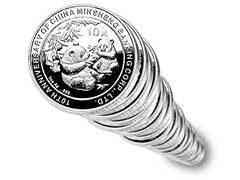 Many experts agree that silver is currently nowhere near its actual market value. One pro is that this type of investment can be purchased even with smaller budgets while gold bullion coins require significant funds because most online dealers impose a purchase minimum of 5 ounces. Silver bullion coins will follow the same trends that gold, platinum and palladium do, so this metal can be very profitable as well. It can be more profitable than other precious metals if the market is a bull market, because your rate of return can be triple. With gold and other precious metals you may only be able to double your return. This makes silver a better option for many investors. One downfall of silver bullion coins is that if the price of gold drops substantially, the price of silver will normally follow. This is for the same reason that this can be a good investment, because this metals follows other precious metals on the market. An advantage of silver is that it is widely used in industrial applications, which increases the demand for this metal and causes silver bullion coins to become more valuable over time usually. Research where to buy silver bullion and you can usually get a low premium over the value of the metal. Most dealers will buy and sell gold bullion coins, and those of other precious metals, so you can find many companies which have a solid reputation and long history. Silver bullion coins have both pros and cons, but for most investors the pros of this metal far outweigh any disadvantages. Precious metals can be an excellent choice for investments, and this is true for this particular metal as well.